Gameboard of the Gods is a book I was very eager to get into. Mythology is impossible enough to resist but paired with a dystopian setting? Sounds amazing to me! Plus Richelle Mead is an author I'd promised myself I'd finally read this year (and about time too), so this really was a win/win scenario! Unfortunately, Gameboard of the Gods didn't really fit into what I came to expect from reading the blurb, and while there were some elements of the book that I enjoyed quite a bit, other things really left me wanting and others just fell flat for me altogether. In Gameboard of the Gods, we're introduced to a futuristic world following what the blurb tells us is: ''a near destruction of the world by religious extremists''. It's never made clear when this near-destruction occurred or even how, but since then, the world has begun to return to something not so different from our own current way of life. Technology, information & the military have re-emerged stronger than ever - at least in what we know as North-America anyway, and the governing bodies work hard to control and restrict most re-emerging religions in an attempt to avoid whatever happened to bring on the 'Descent' in the first place. The two main characters, Justin & Mae have vastly different jobs and realities at the start of the novel. Justin is an exiled ex-investigator with unique gifts and the mind of a genius, living in the poverty stricken Panama (more or less South-America). Left to his own devices and broken by the reality of his situation, Justin is free to wallow in his addictions - drugs, gambling & women. Mae on the other hand is a praetorian - a genetically enhanced super-soldier that lost her cool for a moment and got into a fight with another soldier. Because of the momentary lapse, she gets re-assigned...to Justin. That's because the RUNA (Republic of United North America), a.k.a. Justin's home before his exile suddenly want to give him his old job back. It seems there have been a series of seemingly ritualistic murders or 'sacrifices' recently and they believe Justin may be able to solve the case. As both characters adjust to their new circumstances, and to each other, it becomes clear that there is a lot more going on here than meets the eye.. Soon both Justin & Mae are wrapped up in a mystery that even they might not be able to handle! This was one of those cases where the blurb on the book jacket doubles as an introduction for the actual book's plot. What's mentioned inside the cover flap never gets fully explained...and that's what I was most curious about: how was the world was almost destroyed? What caused it to evolve into the future Richelle Mead has imagined for us? Another question I had: Where are the Gods?! These have to be the most elusive and mysterious bunch I've ever read about. If it wasn't right there in the title, I wonder if I would have guessed what was going on here until the very end. I was expecting full on Mythology, at least more than a whisper here and there for the better part of the book. Now I know I'm coming off mostly negative in this review, but Gameboard of the Gods did have it's fair share of positives too. The action scenes and intrigue were especially well crafted. Many of the scenes read like I was watching a movie unfold in my mind. It had the right balance of words to keep the pace high and I had no problem imagining it all unfold right before my eyes. The mystery worked really well too especially for the first 3/4 of the book, it kept me reading compulsively - I wanted to discover more clues and put them together. I love a good mystery though and my obsessive need to know might have played a role in that. Beyond that though, I honestly liked getting to know the characters, despite their heavy flaws. I found that their distinct personalities & quirks worked well with this world as well as the story at hand. This was also one of the cases where the alternating POV style was done absolutely flawlessly, it seemed to switch at the perfect moment every time, only overlapping when both perspectives were integral to the plot - which is exceedingly rare in my experience. Looking at the book as a whole, Gameboard of the Gods is one I'm glad I've read. It mostly only fizzled for me by the end because of two reasons: 1- for such a BIG book, the ending hardly offered any resolution. And 2- I just wanted more explanations on this world, on what made it the way it is and on the GODS! At 450 pages and an open ending, I would have liked more concrete answers along the way. I'll be reading the sequel but as an introduction to a series, book 1 should have offered more groundwork so the series could take of from there. Hopefully, book 2 will have more actual gods too! I personally really disliked this book.. the characters were so unlikable and I felt the plot was confusing and some parts weren't explained well. Also, the pace of it was horrible.. at least you had a few positive things to say about it, I didn't even enjoy the action scenes towards the end because I just wanted it to be OVER. Micheline, I agree - I expected a lot more from one of my favorite authors, but I was disappointed as well. And I didn't like Mia or Justin at all... They also felt a lot younger than they were supposed to be. Oh well. You wrote an excellent review! I want to figure them out as well, Micheline! So I will definitely pick up the 2nd book when it comes out. I think one of the things I've always loved in RMs books is that the characters seem so real. And that there is at least one or two characters I feel like I can relate to. 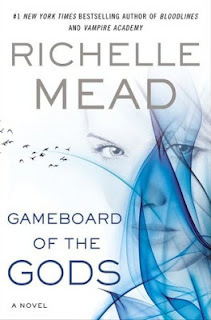 I love Richelle Mead (I've read 15 of her books) but I've heard a lot of similar comments about the worldbuilding in this one and that makes me sad :( As a person who is also into good worldbuilding, I get why this disappointed you! I'm glad the double-POV works well though. I think I'll still give this a try but I'm not in a total hurry anymore. Maybe I'll get the chance to borrow it from someone. This sounds interesting, but the lack of world building would put me off. I also get annoyed with over use of the same words to describe things. Grimace is s a weird word too lol!! I'm glad that you still liked the book, but it's too bad it wasn't quite what you were hoping for. Fabulous review babe!! Thank you so much for this review. I totally agree that this review is totally making me agree with some of the other bloggers of just borrowing. I know I have to read this eventually but...maybe just barrow from the library or something. Thank you as always for your excellent reviews and great insight I really appreciate it. Umm, that plot and concept sounds complicated and way too hard to follow, especially with so limited explanations and set-up. Boo! That is absolutely critical for me and the introduction of a new series. You really need that good groundwork to build from, like you say. Also, I am often bothered by overused words and phrases in books! It might be unfair because surely the author was unaware of its overuse, but it still has the capacity to irk you! Anyways, I'm going to skip this one now. And I will make Vampire Academy my first Richelle Mead book (it won overwhelmingly in my poll) so I hope it's good and it leaves me with a good impression! Thanks for letting me know what to think of this one, even if it wasn't great. Really informative and helpful review! When I first was approved for this book back in Spring I was curious, but after reading the blurb, I was kind of let down, and actually passed on it. I'm kind of glad I did, especially after reading your thoughts. I think t's kind of what you said as far as watching it on the big screen, I think it would fare much better in that venue. Awesome review! I totally agree with you: not enough info. About anything. I felt so lost for sooooo long! There could be more explanation and some scenes could do without - what's Tessa's role here? I had no idea. As for Gods - I think it's them claiming the humans and they use them to fulfill their wishes. Although they were barely defined and Mae's god came into play at the very end. I liked the mystery, the actions scenes were totally amazing, as you said, and the POVs awesome. Mead is a master writter, but still, this book was a let-down. After devouring VA and Bloodlines, I expected SO MUCH. Maybe too much. I look forward to second book because the ending intrigued me very much. But it took too long to get there and that's something that irritated me terribly! I usually prefer when they explain or expand on the world, but maybe in the next installment they will? That usually bugs me, but I still want to read this at some point because it sounds cool, and the action and well done POV make me want to give it a try. Thanks for reviewing!